Corporate Chronicles : What made Paytm employee with about 70 lakh annual package get to the wrong side of law? 24-10-2018 | Noida (Gautam Buddha Nagar): Paytm is easily one of the most recognizable Indian brand when it comes to online space, however now it is making front page headlines for a not so good reasons. Long-time secretary and head of Paytm’s corporate communications, Sonia Dhawan has been arrested along with her husband and one other for allegedly stealing some data and blackmailing the Paytm founder. 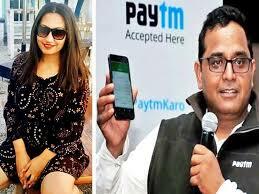 Sonia who had joined Paytm when it was still in a very early stage, was currently one of the most trusted aides of Vijay Shekhar Sharma. She was reportedly employed at a whopping annual package of as much as 70 Lakh per year along with having crores worth of shares in the company. Indeed what made her commit the crime, would only be clear after the investigation but it of course raises more than one questions. Corporate grape vine is abuzz about the nature of data that was being allegedly used to blackmail paytm founder to the tunes of 10 crore rupees. Paytm has however clarified that it has to do nothing with the personal information of its millions of users and the ‘data in question’ was related to the founder Sharma. The police team acted swiftly over Sharma’s complaint of receiving extortion calls and messages and started a probe. It is being reported that Sharma had named her secretary of 8 years, Dhawan as one of the suspects in the case. She was allegedly pressing Sharma to pay the money to the blackmailer and get rid of threats. Sharma however persisted and initiated a legal probe without taking anyone else in loop. Dhawan along with another administrative staffer of the company-Devender Kumar was arrested from the desk when they were working at the Paytm office. The whole operation was kept completely under the wraps given its high profile nature. Another accused that is believed to be in Kolkatta and was communicating with Sharma to extort money is still on the run. Dhawan’s family members have however refuted all the claims and have said that she is being framed. Many others also believe that she already had a very secure job and high paying salary to fulfil her dreams and get whatever she needed. It is still to be known as to who among she and her property dealer husband the actual master mind was and what the real intent was. Speculations are also abuzz that she might have wanted to quit and start another Paytm like company to mint crores instead of lakh. Being one of the oldest employees, she had most of the information that she needed and it indeed was the initial investment that may have led to the hatching of this extortion plan. However all this still remains mere speculated theories, and the real truth may only be out in coming days when police completes its probe and sheds more light over arrests. #Live #International Steel Conclave 2018 starts today in Delhi.